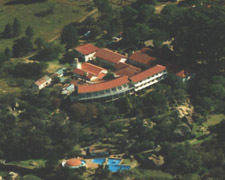 Situated on the historical Battlefields halfway between Gauteng and Durban, the Natal Spa Hot Springs Resort and Conference Centre is a retreat for businessmen looking for an overnight stop, conference, training workshop and teambuilding opportunities. Rooms are en-suite with bathroom and/or showers, tea/coffee making facilities, telephone, television with DSTV. With 3 well equipped conference venues, superb cuisine, sporting and recreational activities, Natal Spa offers the perfect environment for motivation & creativity. Built around a hot spring that was discovered in the 1880's the healing qualities of the hot mineral waters of Natal Spa is a big attraction. From the picturesque KwaZulu-Natal Bushveld to the Bivane River that runs through the property, you can do no better than just surrender to it's tranquility.